In the midst of an old growth forest about 50 miles northeast of Seattle in Snohomish County, the town of Oso, Washington is a small, close-knit, blue-collar community. Less than 300 people live in Oso, and none of them could have imagined the impact that the events of the morning of March 22, 2014 would have on their lives; or how it would bring the community together through tragedy. A nearby hillside collapsed, creating a wall of mud and debris that engulfed a cluster of homes known as Steelhead Haven, dammed a portion of the Stillaguamish River and blocked Washington State Route 530. Initial reports were that more than 150 men, women and children were missing. As a qualified Naval enlisted expeditionary warfare specialist, Olson used the skills and proficiencies he attained and honed through military training and deployments to the Middle East as part of PSU 313, to traverse the dangerous and unstable ground. Olson led reconnaissance patrols, setting waypoints that would eventually become the working grid map for the entire western division of the slide area. The slide left a field of debris that covered about a square mile, and in some places was more than 30 feet deep. Heavy rainfall combined with floodwaters caused by the backed-up river created an unstable terrain of mud and debris. Massive trees that had once stood tall littered the hillside like broken matchsticks. As recovery operations in the slide area progressed, the official number of missing persons dropped to 43. Olson assisted in creating landing zones for the search and rescue and military helicopter crews within the slide area, and was eventually attached to the Snohomish County Technical Rescue Team as manpower augmentation, acting as a representative of Fire District 25—the Oso Fire Department. These early days he spent digging with shovels, and sometimes bare hands, in the mud. Safety concerns limited the abilities of response personnel to enter the slide area. After five days of manual digging using shovels and their hands, responders were able to bring in heavy equipment and the response efforts became more organized. 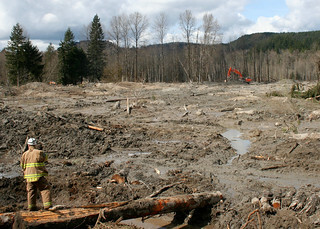 The slide area was divided into eastern and western divisions, with multiple zones where equipment operators lifted layers of mud and debris in an attempt to locate and remove human remains. Olson spent more than 260 hours over 24 days helping affected Oso residents with recovery efforts, alongside community members, firefighters and EMS personnel. 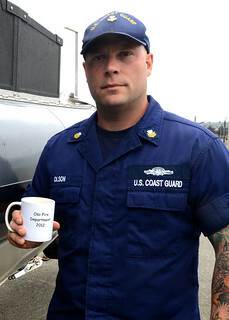 Not only did he provide the technical expertise required to safely navigate the recovery area, but he worked closely with the chaplain from Naval Station Everett, Washington, to provide emotional support for those who lost, and in some cases, helped to recover their loved ones. The town of Oso was thrust into the national spotlight when the deadliest landslide event in U.S. history changed the town’s landscape forever. Ryan Olson is one example of the resilience of Oso residents. While the eyes of the Nation may be diverted to other catastrophic events, his actions and those of the professional and volunteer rescuers certainly represent the best of humanity.